Suggested tasks are the tasks created by Reply automatically to convert more prospects into customers and improve your campaign performance. Suggested tasks are created with certain regularity (based on particular case) and expire after their due date passes. The system generates suggested tasks and they can be seen in a specific section (SUGGESTED) later will be available generations for particular date in the future. When suggested task expires it will still be visible in the PAST DUE section. You can do the Finish, Delete or Archive actions with suggested contacts, as you do with regular ones. In cases where the tasks have been marked as Finished or Archived, suggested tasks will become standard tasks and will be available for a particular time in the future. For example, if a task had a due date of June 1st, but it was marked Finished on May 30th, it will be shown in the May 30th section. Right now, Reply creates tasks for the contacts that were finished in a campaign, but who did not respond to your communications activity (received all emails from the campaign; emails are not bounced not are they marked as opted-out). Every two weeks on Mondays, Reply analyzes campaigns and creates Suggested tasks for contacts that were finished in campaigns and idle for 14 days. If you click on a batch of suggested tasks on the Tasks page, you will be redirected to the People page, where you can make actions (for example, move to another campaign) with the list of prospects from this suggested task. You can set up the system to create a suggested task after the prospect views your email several times. In your Reply account, open the Settings page. Under the Settings page, click Tools and scroll down to the Tasks subsection. Pull the Suggested tasks slider to activate it. 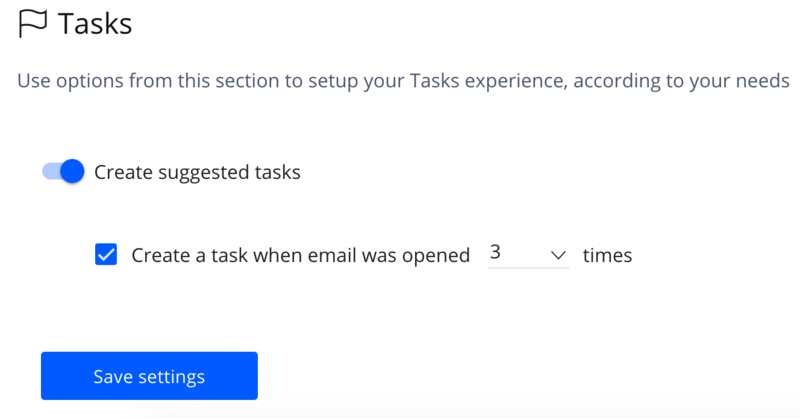 Check the Create a task when email was opened check box and select how many times a contact must open your email to create the suggested task. The prospect has already replied in this campaign. The prospect has already opted-out. The prospect has already bounced before suggested tasks generation. The prospect was already contacted by phone.